In this David and Goliath story, proud Scottish homeowners take on The Donald over one of Britain's very last stretches of wilderness. In this David and Goliath story for the 21st century, a group of proud Scottish homeowners take on a celebrity tycoon. At stake is one of Britain's very last stretches of wilderness. American billionaire Donald Trump has bought up hundreds of acres on the northeast coast of Scotland, best known to movie-lovers as the setting for the 1983 classic film LOCAL HERO. And like the American oil tycoon played by Burt Lancaster, he needs to buy out a few more locals to make the deal come true. In a land swimming with golf courses, Trump is going to build two more - alongside a 450-room hotel and 1,500 luxury homes. The trouble is, the land he has purchased occupies one of Europe's most environmentally sensitive stretches of coast, described by one leading scientist as Scotland's Amazon rain forest. And the handful of local residents don't want it destroyed. After the Scottish Government overturns its own environmental laws to give Trump the green light, the stage is set for an extraordinary summer of discontent, as the bulldozers spring into action. Water and power is cut off, land disputes erupt, and some residents have thousands of tonnes of earth piled up next to their homes. Complaints go ignored by the police, who instead arrest the film's director, Anthony Baxter. Local exasperation comes to a surreal head as the now "Dr." Trump scoops up an honorary doctorate from a local university, even as his tractors turn wild, untouched dunes into fairways. Told entirely without narration, YOU'VE BEEN TRUMPED captures the cultural chasm between the glamorous, jet-setting and media savvy Donald Trump and a deeply rooted Scottish community. What begins as an often amusing clash of world views grows increasingly bitter and disturbing. For the tycoon, the golf course is just another deal, with a possible billion dollar payoff. For the residents, it represents the destruction of a globally unique landscape that has been the backdrop for their lives. Funny, inspiring and heartbreaking in turns, YOU'VE BEEN TRUMPED is both an entertaining, can't-believe-it's-true tale and an environmental parable for our celebrity driven times. A moving score features music from jónsi, the internationally acclaimed musician and frontman of Sigur Rós. The film also offers a rare and revealing glimpse of the unfiltered Donald Trump, as he considers standing as a candidate for President of the United States. 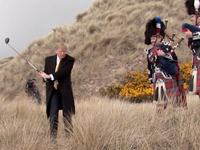 "Here in the U.S., Donald Trump is known as a cartoonish buffoon--But he's no laughing matter in Scotland where he buys off the government and destroys a pristine and fragile coastal sand dune to build the world's biggest golf course. This moving documentary follows the efforts of the ordinary folk to preserve a fishing and farming community that, supposedly, stands in the way. You've Been Trumped is essential viewing for developing an understanding of the issues surrounding unchecked development, its impact on environmental sustainability, the unholy alliance of big money and public policy, and the consequence of excessive inequality that has divided our modern world between the 99% 'have-nots' and the one per-centers who've got it all but still want more." "Thoroughly illuminates the grandiosity of Trump, the subservience of political officials (including the police) to one with money, and the determination of the local inhabitants to resist on their own. Filmmaker Anthony Baxter shows how one of the 1% really feels about 'ordinary' people. While not yet resolved, Trump's arrogance and sense of entitlement seem to work against him and his project as the plight of local residents gains increasing support from people in and around the area." Dr. Kim Scipes, Associate Professor of Sociology, Purdue University North Central, Author, AFL-CIO's Secret War against Developing Country Workers: Solidarity or Sabotage? "Will leave viewers astonished and appalled, but hardly surprised. The rolling, green hills north of Aberdeen, long the bucolic home to a quiet class of proud people, suddenly finds itself in the cross-hairs of Donald Trump's ambitions for a new golf course and resort. Trump, beyond making a fool of himself, does his best at representing the machinations of global capital through his indifferent, apathetic destruction of anything that lies in his way." "This thoughtful documentary raises troubling issues about the tactics of international developers and their impact on the people of local communities. The filmmakers take the time to show how rushed and badly conceived development disrupts lives and destroys important landscapes, even in the heart of the developed world." "This is the story of how the local community resisted the destruction of their environment and livelihoods, in vain in the end, and how the Grampian police force acted as the unpaid henchmen of Trump's company, intimidating journalists and locals who openly and quite legally opposed Trump's outrage. Even the local university was co-opted, to its perpetual shame giving Trump an honorary doctorate in business management." "A beautiful, moving, tragic film, that clearly and simply shows how the super rich like Donald Trump are destroying peoples lives and our global environment for their own personal gain. This is what we all can look forward to if we don't stop Corporate Feudalism in its tracks." "Provide[s] a fine-grained account of a single instance of capitalism unbound...Expertly composed...Trumped affords an intimacy of character and theme that conveys the truth of anti-capitalist axioms - that the state does the bidding of corporations, that law is servant to profit...It is an aching lesson in the skewed balance of power that asks, as its grace note, where human richness truly lies." "Eye-opening...Absolutely fascinating and presented with a wry sense of humor, perhaps best exemplified by its glimpse of an inspired, anti-Trump art show! Highly recommended." "Embodies the territorial, livelihood, and ecosystem issues that run through most environmental conflicts...This film could serve as a welcome complement to academic material that engages these themes...Evocative." "American-style capitalism has never looked so ugly...Recommended." "We get to know the residents of the affected area through their stories about their personal connections to the land. We learn about the research value of the dunes from scientists who specialize in this area of study. We hear local officials describe the rules that were applied when the resort proposal was denied...Outrage at environmental and cultural degradation and subtle filmmaking technique all make this a compelling movie. It is highly recommended for junior high through adult audiences." "The film is a depressing, therefore accurate, account of the way that power can trample people and environment...Every development happens on somebody's land, and all too often, whether they are indigenous villagers or the modern underclass, the benefits of development are not theirs, while some of the highest costs of development are entirely theirs. Suitable for high school classes and college courses in cultural anthropology, economic anthropology, development anthropology, anthropology of globalization/neoliberalism, and European studies, as well as for general audiences." "With the rest of the audience that day I came out into the daylight dazed and shocked...This factual film has delivered just as much drama and poignancy as any fictional equivalent could. And it celebrates the positive side of the human soul when pitted against the pernicious." "In medieval times, the nobility enjoyed something called droit du seigneur, their right to deflower their serfs' virgin daughters before their marriage. These days the nobility has been replaced by billionaire bullies, who continue to screw us serfs." "The film provides the critical inspection missing from mainstream media accounts. It exposes irreparable environmental damage to an area of pristine seaside dunes designated as a 'Site of Special Scientific Interest', suspiciously complicit government action, and shameless bullying by the Trump Organization." "Baxter's directing mixes various artistic elements...to illustrate the differences between Scotland's rugged beauty (and that of its locals) and the garish McTrump-style development. Dust, wrinkles and blowing sand create a stark contrast when interrupted by endless manicured greens and dunes, not to mention spray tans. You've Been Trumped alludes to how the business mogul uses glossy PR and greases palms to grow his empire. More subtly, it begs the viewer to reconsider how they travel." "The film raises issues that strike at the very heart of democracy...Whether we live in Scotland, India or elsewhere, it begs the question: Are we willing to be 'Trumped' on a massive scale?" "Frequently outrage-inspiring...It's an elegiac love letter to a very special part of the world, an inspiring portrait of a community's fortitude, and a searing indictment of capitalism run riot." "An eye-opening documentary about the power of money." "I think of Donald Trump as the excessive American, the American whose success has led him to inordinate power and to hideous self-worship...A man whose exploits have become so impressive to himself as to obliviate any need for even a pretense of humility or equality with other mere mortals. You've Been Trumped adds to this impression. In it we watch Trump turn before our eyes for the ugly to the grotesque." "A roiling, go-for-the-throat expose. Recommended." "Donald Trump is the face of America here...Hopefully this sharp rendering, or something very much like it, is the legacy for which he and his family will be remembered." "Documentaries such as this are becoming more and more frequently the only way to depict the threats posed to our remaining environmental heritage and how little is often done to halt it." "A 'David and Goliath tale'...Unlike that fantasy, this tale didn't end in victory for the little men."